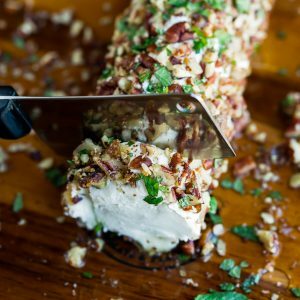 This tasty Maple Pecan Goat Cheese Log will add some savory sweetness and a whole lot of deliciousness to your holiday appetizer spread. Ready in minutes! Remove goat cheese from wrapper and allow to soften to room temperature. Once butter starts to bubble, add your pecans, brown sugar, and pinch of salt. Roll your goat cheese in the nuts and (optional) mint, pressing gently to coat. Place the goat cheese in the center of your cutting board or serving dish and drizzle with maple syrup and honey. I even drizzled a little as my base before adding the goat cheese log for presentation and maximum savory sweetness. So good! I'm leaving the mint up to y'all since I know some people loooooove adding chopped mint to dishes and others run in the opposite direction from it. You can even try adding mint to just half the cheese log and let your guests decide! Personally, I love it! Craving cranberries? Try adding 1/3 cup chopped dried cranberries to the mix!